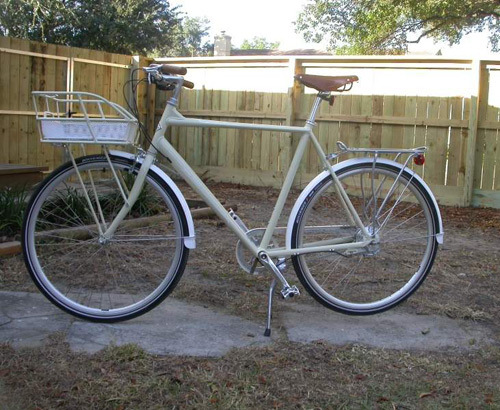 I recently purchased a Gary Fisher Simple City 8M (from Carrollwood Bicycle Emporium in Tampa, Florida) and although there was a lot of early attention to this bicycle on the net I have seen little posted by actual owners. The Simple City is an interesting ride that is hard to categorize. I bought it because it fit my need for a fun and useful urban bicycle. However, before telling you about what it is, I want to clear the table a bit and mention what it is not. The Simple City is not a “Dutch Bike�?. It does not come with a full chain guard, a coat guard nor a built in lock. The Simple City is also not a cargo bicycle. Despite the prominent front basket, you can’t load up heavy stacks of newspapers or machine parts. 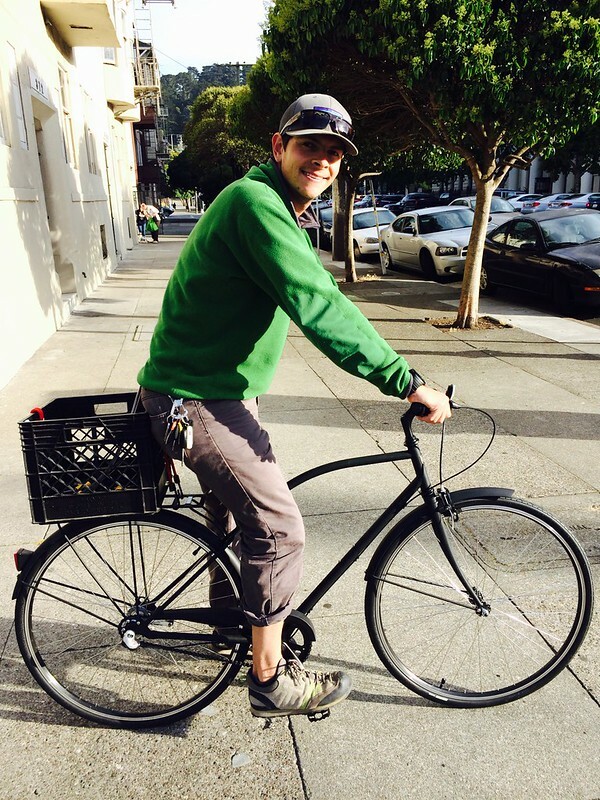 This bicycle is also not an “indy-hipster-steel-is-real�? bicycle because the Simple City is essentially a mass produced Trek made out of aluminum in China. Now, a little bit about what the Simple City actually is. According to the marketing story, Gary Fisher was influenced by a “Dutch Shopping Bicycle�? and decided to build something similar. The bicycle has some utility features but also has a strong “fashion bike�? vibe to it. The frame uses oval shaped aluminum tubes and routes the rear cables through the down tube; it also has a steel fork with touring style mount points midway up the blades and 700c wheels with 32mm tires that use Schrader valves. Both the seat post and handle bar stem are alloy and the handle bar stem is a classic adjustable quill design. The pedals are standard metal toothed double-sided jobs with channels and mounting holes for toe clips and straps. The saddle, like many components on the bicycle, is a Bontrager. 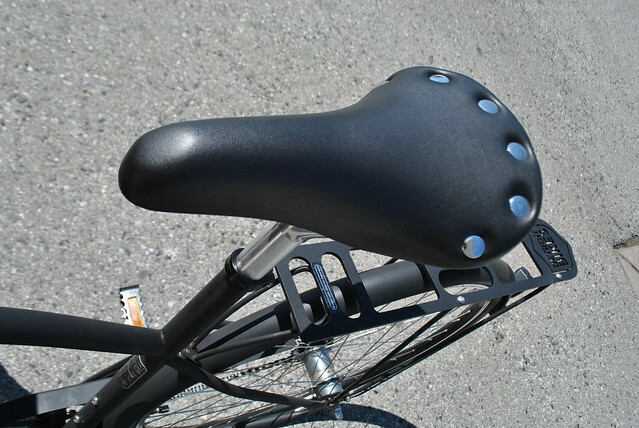 The saddle material is a brown synthetic “leatherette�? with a gel layer. The stock saddle is comfortable and looks good on the bicycle. 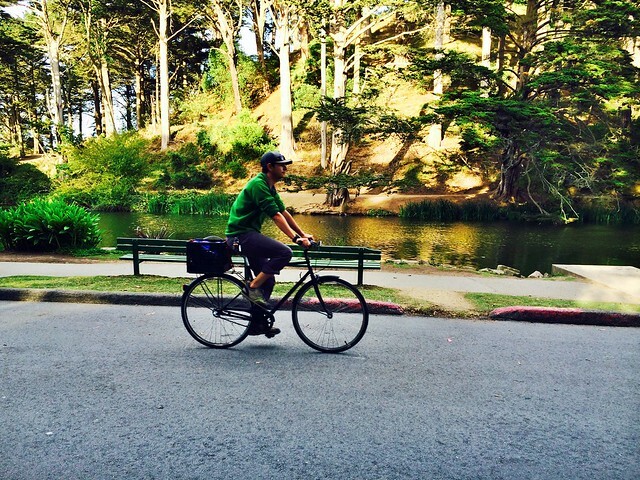 The handlebars are classic looking “city bicycle style�? and come with hand grips that match the saddle. The drive train varies depending on the model but is based around Shimano’s Nexus series of internally geared hubs. The rear brake depends on the hub used and the front brake is a serviceable but plain dual pivot caliper. When not moving, the bicycle is supported by a slick two-legged Pletscher kickstand. 1.) 3M – A matte black diamond frame with crème colored trim, a three speed Shimano rear hub with a coaster brake and an optional front basket. 2.) 3W – An aqua blue drop frame with white trim, a three speed Shimano rear hub with a coaster brake and an optional front basket. 3.) 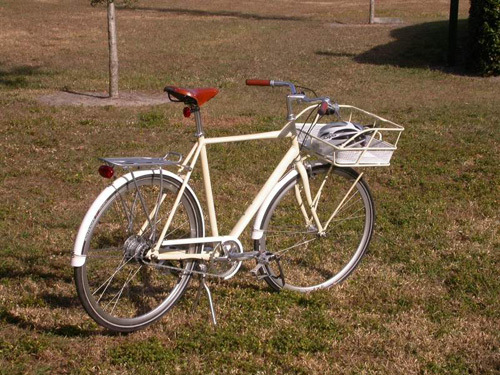 8M – A crème (sand) colored diamond frame with white trim, an eight speed Shimano Nexus rear hub with a rear roller brake and a standard front basket. 4.) 8W – A white drop frame with aqua blue trim, an eight speed Shimano Nexus rear hub with a rear roller brake and a standard front basket. 1.) Drop Frame: Small 16�?, Medium 18.5�? 2.) Diamond Frame: Medium 18.5�?, Large 21�?, Extra Large 23.5�? My personal bicycle is an extra large 8M. I am 6’1�? and weigh about two hundred pounds but have longer than usual legs and a shorter than usual torso. My traditional (not compact) road frames tend to be in the 58cm to 60cm range and the XL Simple City fits me very comfortably. My body position on the bicycle is a bit more aggressive than upright but it is far from a drop bar position. The starting position is very classical in that with the saddle set for proper leg extension, I can sit on the saddle and stay upright at a stop by leaning the bicycle over and balancing on my tip toe. However, I typically get off the saddle at stop lights. I have never felt comfortable on relaxed bicycles like cruisers so I find this position a great solution for regular riding. 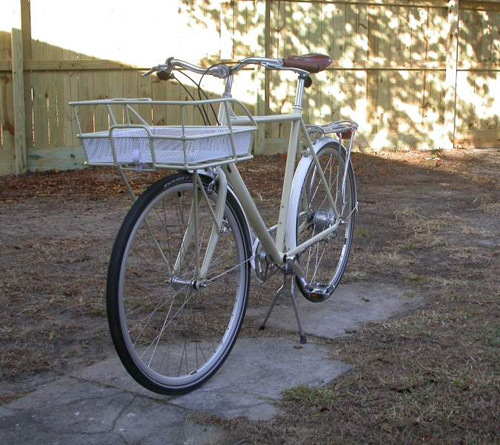 The bicycle’s civilized features include a set of metal fenders in a complementary color and a matching chain guard. The fenders are mounted solidly to dedicated eyelets front and rear. Some have commented that the front fender is too short and I have not ridden it in a real down pour yet so I cannot comment about that issue. The chain guard is a modern and minimalist looking design which I find very attractive. Although I have not managed to catch any clothing in the chain yet, the guard may not do as good of a job as one with more coverage – time will tell. 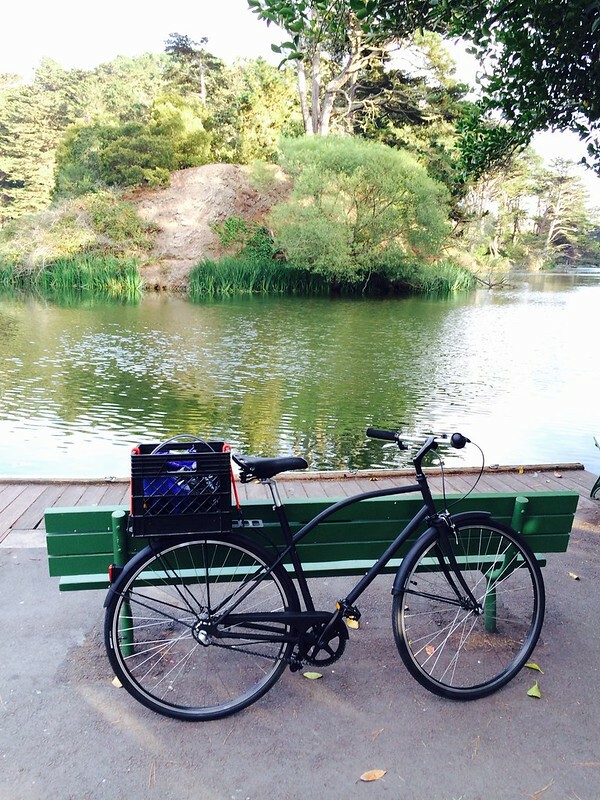 The first thing that everyone notices about this bicycle is the giant metal front basket. People comment about the basket as I ride by them and it’s the thing that people seem to like most about the machine. 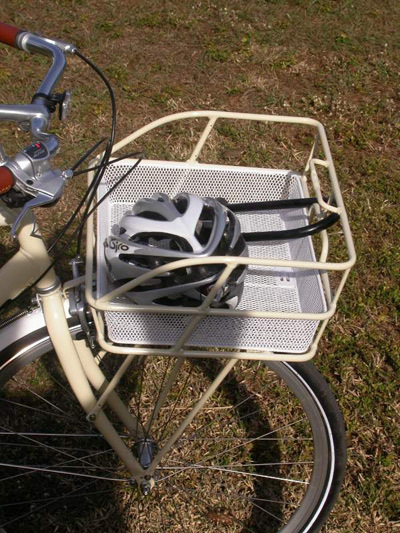 The basket is really a combination of a rack and a basket and is rated for 10kg (22 lbs.). 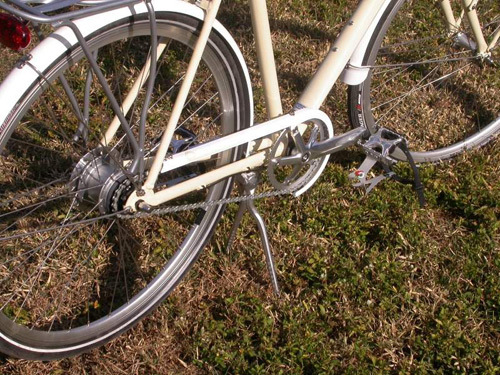 The outer frame of the basket is secured to the bicycle with braces that run to dedicated eyelets at the end of the fork and to the sockets located mid-blade. The frame and basket are also connected to a metal strut that runs from the brake bolt at the fork crown. The frame of the basket is painted to match the bicycle (crème colored on my bicycle). The inner part of the basket looks very similar to a metal mesh in/out bin that might have appeared on a corporate desk in the 1950s and is painted a complimentary color (white, which matches the fenders and chain guard on my bicycle). The inner part of the basket is secured to the outer basket frame by two hex headed bolts and a Velcro strap. If the strap is loose, the basket will rattle like crazy. I’m not sure why Fisher used a Velcro strap instead of simply using another bolt because the inner basket is not meant to come out (editor’s note: we have since discovered that this strap is meant to secure a standard Kryptonite U lock inside the basket). As mentioned above, the basket is standard on the eight speed models but is an optional accessory for the three speed models. The bicycle also has a stiff spring that runs from the bottom of the down tube to the back of the fork crown. The spring is supposed to prevent the fork from rotating too far too quickly and slamming the basket frame in to the bicycle frame while stopped and loading up the basket. However, this is purely guessing on my part as the bicycle came without a manual or any documentation at all. The spring is not noticeable except every once in a while it will make a “sprong�? noise while turning. To test the basket and the spring, I tied two 5kg telescope counterweights into the forward corners of the basket to see how the bicycle handled under a worst-case maximum load. The results, predictably, were not pretty. The first trick is to actually keep the bicycle upright while attaching the counterweights. The bicycle will happily tip off of its kick stand and land on its side if you are not holding it. I then moved the counterweights to the center of the basket and the bicycle would just barely stand on its own as long as you didn’t move your hand too far away. Riding the bicycle with the 10kg load in the basket is possible but is a miserable experience. The bicycle feels like it is riding through sand and it could be used to teach people what the word “inertia�? means. Under a full front load, the bicycle doesn’t want to go in to a turn, and once it does start to turn, it doesn’t want to come back to center. Naturally, the bicycle will handle better if the weight is shifted towards the head tube and centered left and right. Most likely the 10kg load warning in the basket is probably related to structural failure of the basket rather than providing any sort of “safe to ride�? weight guidance. Even if you decide to carry light weight items in the basket, it is advisable to use some sort of bungee cord tie down to keep the items from flipping over the side and to try to minimize rattles. Don’t get me wrong, the basket is useful for lighter loads and very cool looking, but as I wrote earlier: The Simple City is not a cargo bicycle. The drive train on the bicycle is fabulous. The shifting is precise and extremely smooth – under load, coasting or stopped. I have yet to feel that I was missing a step. In other words, the gearing seemed pretty near perfect and has a nice low gear, a nice high gear and no ugly gaps in between. It’s the best shifting bicycle I have ever ridden. While certainly no road bike, the bicycle is remarkably fast. See the graph for the hub’s range in gear inches (using Sheldon Brown’s calculator). The bicycle’s drive train is also completely silent. While the three speed models use a grip shifter, the eight speed models use the higher end Alfine trigger shifter. The Alfine shifter is also the only plastic component on the bicycle. Jack did an earlier review of the Redline 530 commuter which featured Shimano roller brakes. The roller brake is an internal hub brake that attaches to the side of the Nexus hub and is operated by a hand lever. Jack found that the rear roller brake performed well but that the front roller brake was lacking. The Simple City 8M avoids that issue by using the roller brake in back (or a coaster brake on the 3 speed versions) and a traditional dual pivot caliper on the front. I found that the brakes were well matched and perfectly capable of stopping the bicycle comfortably. The only brake drawback is that the front brake does not have a quick release lever so pulling the wheel off will require adjusting the brake or deflating the tire. The Simple City handles well and is surprisingly nimble. Although some may worry about the harshness of ride due to the aluminum frame; harshness is subjective. The Simple City comes with a steel fork, decent saddle and fairly wide tires. I have not found that the ride quality diminishes my enjoyment of the bicycle. My extra large Simple City 8M weighs in at about 34 pounds from the factory. Naturally, bicyclists like to customize their rides and I am no exception. I ordered a Bontrager rear rack from the bicycle shop which attaches to the dedicated rack mounting points. I also transferred my toe clips, my brown Brooks B17 saddle, bell, head lights and tail light from another bicycle to the Gary Fisher. I then placed an order with Velo Orange for a set of panniers, an elegant water bottle cage and a set of matching brown leather toe straps. Note that the drop frame models do not have water bottle mounting points while the diamond frame features two mounting points. Although the head lights mounted fine on the handle bars, I will probably experiment with a way to mount lights farther forward and a little lower on the basket frame. 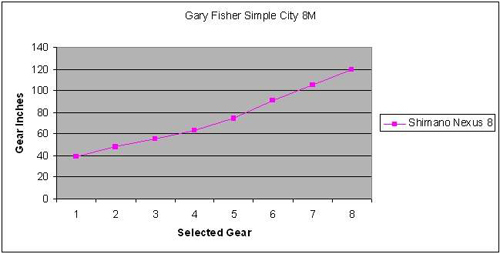 So far, I am very pleased with the Gary Fisher Simple City 8M and would encourage anyone to give the bicycle a try. It may not be the ultimate commuter but it’s a great riding and stylish machine. We’d like to thank Ken for taking the time to do this thorough rundown of the Gary Fisher bike for us…and for taking illustrative photos for the article. If anyone else out there wants to take a crack at a guest article (product review or advocacy/tactical issue), drop us a line — we’ll always entertain reader submissions!